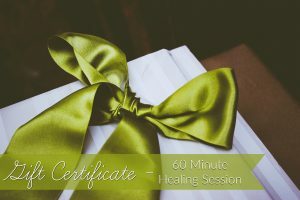 Give the gift of healing to your family and friends! Any of Ann Bibbey's services are available as gift certificates. If you are interested in a gift certificate for a workshop or class, please contact Ann directly by clicking here and a custom option can be created. IMPORTANT: To specify the gift certificate recipient, recipient email, and add a custom message - please click on the product image of your desired gift certificate below and fill out the form when prompted.